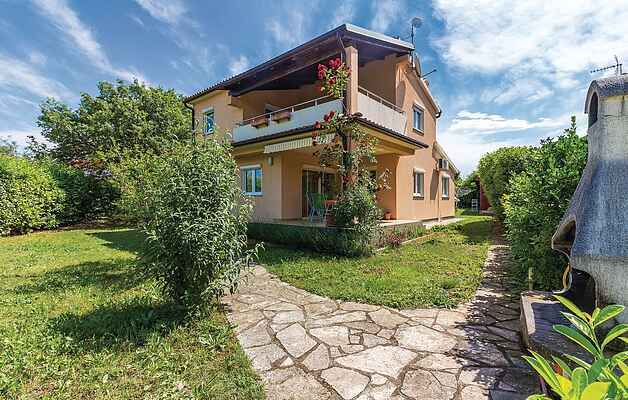 This harmonious holiday house is located in the famous tourist resort of Medulin, near the city of Pula. Comfortable and tastefully decorated, especially the living room, it is ideal for larger familiy or a group of friends. During summer days you can enjoy a glass of superb wine on the covered terrace and prepare delicious grilled meals. The well-maintained, lush garden provides a carefree play for your youngest ones. The first beaches are in the immediate vicinity and you can reach the sandy beach along the coast, which is especially suitable for small children. Apart from the beautiful nature, you can also enjoy a variety of recreative activities, such as horse riding, tennis, diving, surfing, etc. which will surely complement your vacation's quality.